Forget New Hampshire, Little ol' Vermont has bigger beefs... with the state of the union. Okay, the holidays are over. Lets get those conspiracy caps back on. A draft-dodging, grammar-impaired, drunk-driving governor from Texas  without much visible swagger  is about to be inaugurated as President of the United States, and MGM Home Entertainment is releasing a special 40th Anniversary DVD edition of The Alamo, produced, directed and starred in by none other than John Wayne. Coincidence? Get real. Its all about the coming Texas World Order and the Texafication of American life  the ongoing process of injecting fresh doses of discredited Texan, and Western, mythology into the political and cultural mainstream of America. Under this pioneering halo, Texas becomes a freedom-loving, frontier-settling, oil-discovering, law-and-ordering, civilization-bringing, border-protecting, bigger-is-bettering, Bible-Belting and nature-conquering bastion of the great American spirit. Its an America with clear moral absolutes  where right and wrong are, of course, black and white. No gray cowboy hats, please. The men of the Alamo call out encouragement to each other; a settler pushes west and sings his song, and the song echoes out forever and fills the unknowing air. So you werent paying that much attention in January 1985? Well, its a fair bet that George W. will proclaim the words Alamo, freedom and sacrifice in his address this month. An even safer bet would be that he says Alamo (188 American fatalities) before the word AIDS (430,441 American fatalities, 16.3 million worldwide). Texafication is an ugly process and, like your fire-and-brimstone revivalist preacher, hard to stop once under way. So someones gotta take on the mantle of the Anti-Texas  you know, accept the challenge of shearing off the wool that certain Texans will try to pull over Americas eyes. Truth be told, we Vermonters have been coasting along for years, getting our jollies from picking on little ol New Hampshire. Come on, now, Green Mountain Boys and Girls, its time to aim our smugness arrows in a new direction. New Hampshire has been way too easy. Its just sitting over there across the Connecticut River, content as a simpleton in the spring sun, with its dysfunctional legislature, billboards, roadside liquor stores and Powerball stands, a measly half-inch of ocean coastline, blood pressure-raising toll roads, conservative newspaper publishers and an absurd lack of a state income tax. And dont forget New Hampshires quadrennial presidential primary charade, where folks pretend to be undecided and candidates pretend to like cold weather, flannel shirts and slipping over the sidewalks in their loafers. New Hampshire, dont forget, was the only New England state to vote for Bush Nov. 7; its four electoral votes put Bush over the top! Blame the Granite Staters, not Florida chads. Much as we mock and deride them, and offer reasonable suggestions on how they could improve their lives, Granite Staters just dont seem to care. Like mystics wandering the countryside in bare feet with an unsettling glow upon their faces, theyre strangely and inexplicably happy with their lot. So, clearly, its time for Vermont to move on, to take on someone closer to our size  not physically, of course, but politically, culturally and symbolically. Vermont looms large on the American cultural landscape. We pioneered civil unions, said no to commercial billboards, and our teeny capital city of Montpelier continues to repel the giant corporate McDonalds. We have restaurants where smoking is not allowed. Weve turned our noses up at the regressive Powerball tax. Local planning boards have real citizens on them and shake down developers for impact fees, town improvements and donations to local charities. We dont appoint Monsanto executives to guard the environment. Weve got three real political parties. Youre likely to see the governor at a soccer game or at the grocery store. And yet it seems we get more national awards and publicity than most any other place  best place to raise kids, safest state, loosest abortion and gun laws, best place to relocate your non-union high-tech company, best place to start an emu ranch. Everyone, it seems, dreams of moving here, and a lot of them actually do. New Hampshires star is clearly fading, and Vermonts continues to soar, even as the national stage is being taken over by Texans. You have to agree  taking on Texas sure would be fun now, wouldnt it? Cut them Texas egos down to size? Vermont egos would never swell to this size, even if it never snowed in Colorado again, or Madonna relocated to South Burlington, or even if, say, the Logger emceed the Academy Awards wearing nothin but a maple leaf. Our state song is not some trumpet blast of us-versus-them superiority, but rather a gentle, inclusive, flute-like invitation to appreciate and protect the natural beauty of our state. If youre picking on someone, its good to know theyre paying attention. For all the weathering Texans get out on the Plains looking for oil, lost cattle or illegal immigrants, their skin is mighty thin and sensitive. Theyre easier to rile up than a Red Sox fan in October. Heck, just start with the Alamo. You can catapult your average Texan right into orbit with the stuff that was kept out of the movie. The Alamo at San Antonio fell on March 6, 1836, to a force of about 4000 Mexican soldiers commanded by Mexicos 40-year-old president, Gen. Antonio Lopez de Santa Anna, after an 11-day siege. Davy Crockett, 49, and James Bowie, 39, were among the dead. Texas, of course, went on to become a slave state and member of the Confederacy. Contrast that to Vermont, which upon being admitted to the Union in late 1791, became the first state to outlaw the practice. In his campaign for president, George W. said he wanted to make the rest of America more like Texas. Anyone whos more than a little wary of the intention behind this statement might be forgiven. 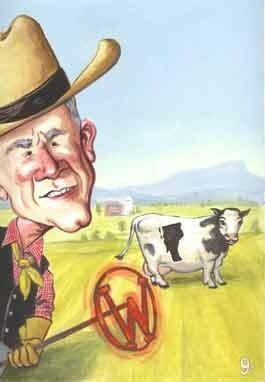 The Texas that George W. sees as a model has the worst, or close to worst, state rankings in a number of areas: teen births and divorce; juvenile arrests; number of medically uninsured children; infant mortality; early pre-natal care; rates of child abuse and neglect; overall conditions for bringing up children; per capita state spending on public health; family income; percentage of workers in unions; welfare payment for family of three; spending on parks and recreation; executions and minimal human rights for prisoners. The environmental record is not so hot, either. Texans apparently have a philosophy that economic progress at nearly any price is good, and that business by necessity gets a little messy at times. Just consider the huge Texas oil spill exactly 100 years ago that ushered in a great boom. On January 10, 1901, the famed Spindletop gusher was struck in Beaumont, an oil field so huge it held more oil than the rest of the United States combined. The flow was stupendous  110,000 barrels a day  and it flowed unchecked for more than a week before it was contained. Maybe Texas longstanding well-deal-with-it-later mentality about the environment was the reason most Texans didnt have a problem with the Sierra Blanca nuclear waste storage facility proposal. Of course, it was dumb for Vermonters to want to ship their low-level nuclear waste from Vermont Yankee all the way to Texas, but you might say it would have been even dumber to accept it. Watch for the new President to do a lot of delegating, just like he did running Texas. George W. called a 1999 bill his greatest environmental achievement as Governor, but critics charged that the bill  which closed loopholes for more than 800 industrial polluting plants  was practically written by the polluting companies themselves. The conservative theme of voluntary compliance, rather than litigation, was invoked without snickers; but, according to the Dallas Morning News, only 30 of the 450 plants that werent facing federal or state mandated emission cuts actually began a voluntary program. The voluntary style of pollution control is something that W. wants to try on a national scale. Its one thing for Texans to trash their own state, but when they want to take it national, thats when we need to take a stand. Instead of the Texas Rangers storming over the top of the hill to save the day, maybe its time for someone else to have a go at the guv. Maybe that little ol state in New England with the former Great Lake. For the next four  or eight  years, Vermonts small size, its pioneering social and environmental legislation, and its hard-headed choice to stand outside the mainstream could be a beautiful burr under George Bushs saddle. Texas vs. Vermont  No Contest! To be born a Vermonter and die a Texan. Is there a more ignominious fate? Consider the unhappy tale of a couple of young farm boys who left Pownal in the late 1860s and wound up in Texas, bearing partial responsibility for one of the great destructive hurricanes to sweep through the Old West  destroying a sacred resource. In the early 1800s, the buffalo in North America numbered about 40 million; the Texas territory had huge herds. But at the end of the century, there would be fewer than a thousand of the majestic animals left. Historians note that the two Vermont brothers helped to bring about a small technological development in 1871 that wrote the death sentence for millions of buffalo. Between 1871 and 1879 about 10 million buffalo in the Southern herd would perish. The very last buffaloes of the once-immense Southern bison herd were killed by hunters at Buffalo Springs, Texas, in 1879. J. Wright Mooar was fresh from Vermont, about 20 years old in 1870 and working as a wood-cutter near the frontier town of Fort Hays, Kansas. Prof. Ralph Andrist detailed Mooars story in his 1964 textbook: A friend, who hunted buffalo to supply meat for the post commissary, threw away the skins, and probably young Mooars frugal New England soul was repelled by the waste. He and his friend put a bale of about 50 skins together and sent them to Mooars brother John in New York. After the hunters wiped out the buffalo in Kansas and Texas, each of the Mooar brothers married and settled in West Texas, John in Colo-rado City and Wright on a ranch near Snyder. Southwest historian Wayne Gard notes, John lived until 1918 and Wright until 1940, but neither found any new adventure to match those of the buffalo range. The brothers are considered Texas pioneers and their papers and letters are part of the state library collection. The librarian at the Vermont Historical Society says hes never heard of them. . .